Pilot Adam Philbrook uses hand signals on Wednesday, March 21, 2012 to help guide the tug he is riding closer to the pilot's ladder aboard the Bow Saga tanker carrying caustic soda headed for Mack Point. Philbrook is an apprentice pilot and was brought aboard the large tanker to allow him the added experience of the larger ship. Philbrook was sucessfully in guiding the tanker to its berth at Mack Point in Searsport. The BBC Orinico, a St. John-based heavy bulk lifting cargo ship unloads freight at Mack Point in Searsport. A small tug (partially obscured behind the bow) maneuvers the Great Eastern, a 594-foot-long chemical tanker, into port at Mack Point in Searsport recently. Deck hand Mark Coffee handles line aboard a tug attached to the tanker Bow Saga as it approches Mack Point in Searsport on Wednesday, March 21, 2012. 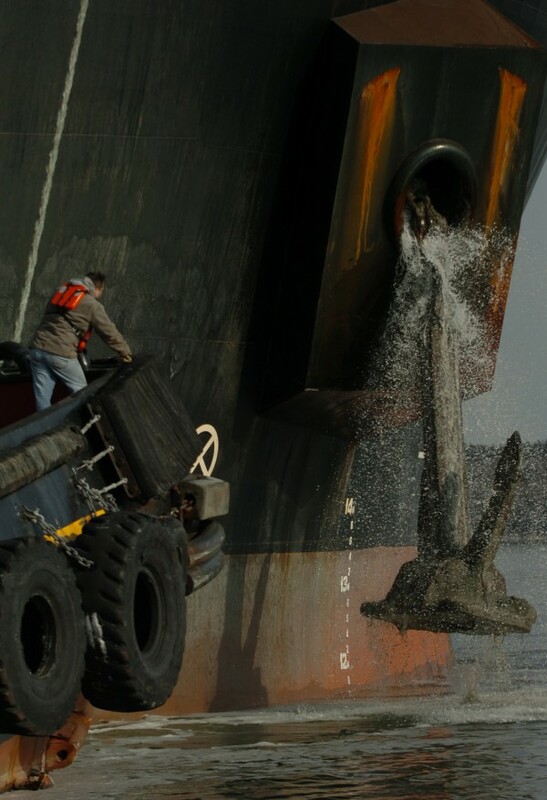 A crew member aboard the tugboat Fournier Tractor watches as the massive anchor on the Baldock is pulled up Jan. 24, 2008, after the ship spent the night anchored in Penobscot Bay. SEARSPORT, Maine — Penobscot Bay was as calm and shiny as glass when the tugboat pulled up alongside a bright orange vessel that towered far above it. 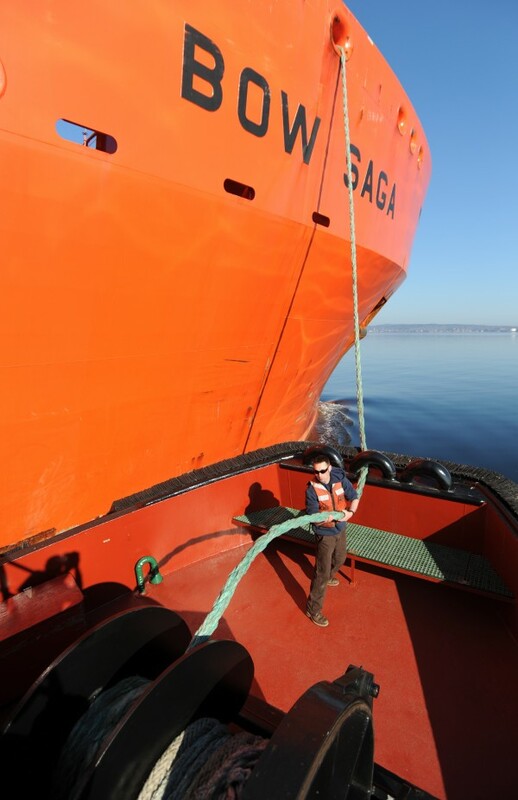 The Bow Saga, a Norwegian-flagged ship carrying a load of liquid caustic soda last week for use in Maine’s papermaking industry, needed a pilot to come aboard who was familiar with the local waters to guide it into a berth at the Mack Point industrial dock in Searsport. So Adam Philbrook of the Penobscot Bay & River Pilots Association got ready to board the much bigger ship. After some shouted conversation with the all-Filipino crew aboard the Bow Saga, the two ships were attached by massive lines and a wood-and-rope Jacob’s ladder was dropped over the side of the big ship. Philbrook grabbed the ladder and clambered aboard, quickly moving up the side of the big ship. “One hand for the ship and one hand for yourself,” he had said earlier while still inside the cabin of the tugboat, the Fournier Tractor, describing the sometimes-dangerous job of boarding ships at sea. It’s a common saying among seamen and it was all in a day’s work for the pilot, who is one part of the intricate system of workers and equipment that keeps shipping in Penobscot Bay moving smoothly and safely. 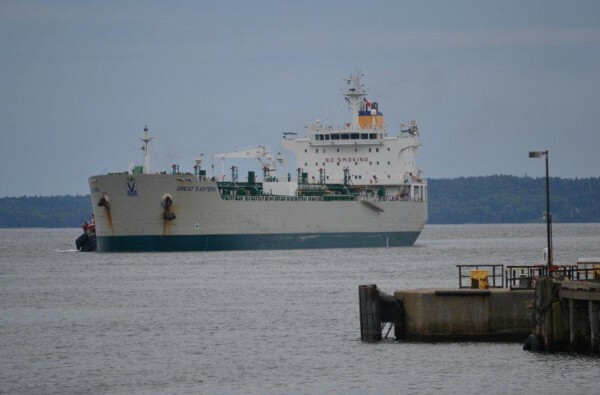 Last year, 3.3 million barrels of petroleum and 1.7 million barrels of liquid bulk goods, including caustic soda, entered Penobscot Bay on tanker and freight ships from all over the world. Those numbers include cargo destined for the ports of Bucksport, Camden, Rockland, Winterport, Belfast and Bangor, too, but much of it was unloaded at Mack Point in Searsport. The Penobscot Bay town has been a working port for more than 100 years, but these days, instead of tall wooden ships being built on the harbor, the work takes place at the much more industrial-looking Mack Point. The port and shipping lanes of Penobscot Bay have been in the news lately because of a controversial liquid propane gas terminal, which if built as proposed by Denver-based DCP Midstream would add a large propane tank to Mack Point’s skyline and also four to six propane tanker trips a year to the port. While the 22.7 million gallon tank potentially could be 137 feet tall — much larger than the roughly 50-foot-tall tanks that already are there — port and shipping officials say that safety concerns on the part of the public may be misplaced. Most people do not know how much commerce already occurs at the industrial seaport and how strict the safety regulations already are that govern the shipping of fuel and other materials. “Most people around here have no idea,” boarding agent Len Young of Stockton Springs said of the activity that happens at Mack Point. John Henshaw, executive director of the Maine Port Authority, said that Mack Point has been used to import fuel since World War II at least. A pipeline used to run from the port all the way to the former Loring Air Force Base in Aroostook County, he said, and the large tank farm now owned by Sprague Energy was a defense fuels farm. Jim Therriault, vice president of materials handling at Sprague Energy, said that the industrial port is one of the company’s larger terminals. The property, which boasts 30 tanks, is nearly invisible from the cars whizzing past on nearby Route 1. It once was owned by the now-defunct Bangor and Aroostook Railroad, then was sold in pieces when the company went bankrupt. Sprague Energy now owns much of the facility and Irving Energy leases some property from the state of Maine, which owns part of the port including a deep-water bulk dock. Therriault said that about 160 ships a year come to the liquid dock to unload their cargoes of heating oil, diesel, gasoline, kerosene, residual fuel oil, asphalt and clay slurry which comes from Brazil and is used in the paper industry. A much smaller number of ships — between a dozen and three dozen vessels tie up at the bulk dock each year — bring commodities such as road salt, gypsum rock, windmill components and petroleum coke — a fuel similar to coal — to this part of Maine. 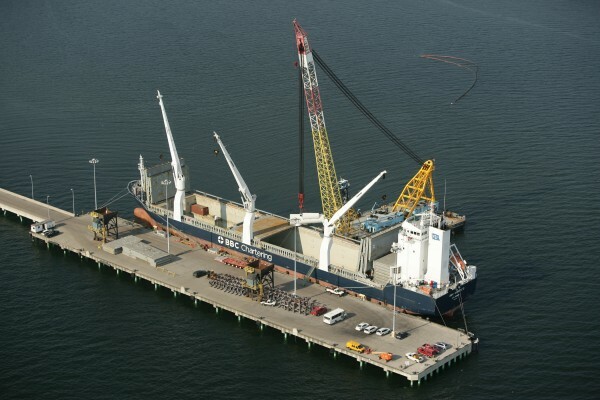 According to Therriault and others involved with shipping in midcoast Maine, a brand-new, 144-metric-ton harbor crane purchased by the Maine Port Authority and installed last month at Mack Point hopefully will increase imports and even exports there. David Gelinas, president of the Penobscot Bay & River Pilots Association, said that while he understands the concerns of area residents who spoke out against the propane terminal, he believes that the terminal is crucial to the midcoast and beyond. Shipping by water is much more efficient than even the most technologically advanced trains and also is much cleaner, according to the pilot. Shipping and port safety in Penobscot Bay are highly regulated by government and other agencies, according to a U.S. Coast Guard official. “The Coast Guard port state control oversight is just one layer of safety built into the shipping industry,” she said. Other agencies involved with regulating waterfront facilities such as Mack Point and making sure that such facilities have up-to-date safety plans include the federal Environmental Protection Agency and Waldo County Emergency Management Agency. 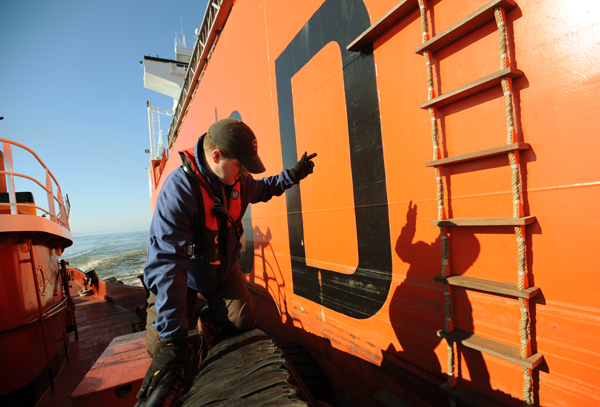 Ostrander’s unit is responsible for inspecting vessels, screening foreign vessel arrivals and ensuring safety and security at 23 waterfront facilities, including seven bulk oil facilities, between Owls Head and the Canadian border. All big vessels coming into Penobscot Bay must give the Coast Guard notice of their arrival, informing officials what they’re carrying, where they’re coming from and which nation’s flag they’re sailing under. “So we have a big picture of what’s coming in when,” she said. The Coast Guard runs the ship’s information into a model that assesses potential risk. 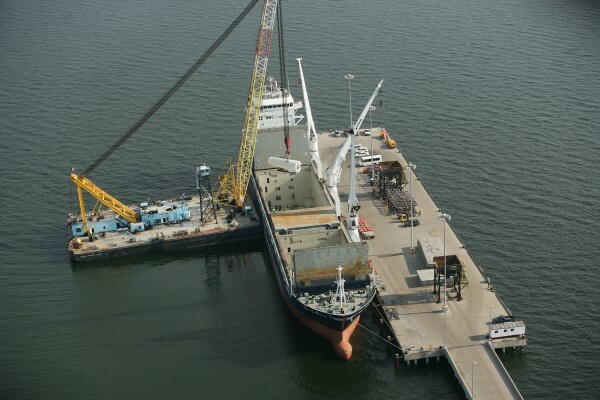 If a ship scores high enough, Ostrander’s unit could do an offshore boarding — but the vast majority of such actions are done at the dock, after the ship arrives. However, a crew of Coast Guard officials did board the Bow Saga early this particular morning off Rockland, spending a couple of hours checking the ship for security and safety measures. If they find a major safety problem, the Coast Guard’s sector commander for Northern New England has the ability to detain or expel the ship. “But more often than not, it’s ‘fix it,’” she said. Ostrander said that typical problems could be as small as failing to properly fill out the ship’s garbage log. In the year and a half she has been working in Belfast, the Coast Guard has not needed to detain any vessels. Ships must meet the standards for Safety of Life at Sea, she said — and the shipping operator also is invested in making sure those standards are met. “If a ship is stuck at dock, they’re not making any money,” Ostrander said. And once the ship is docked, safety continues to be a primary concern, Therriault said. Mack Point has a security plan and the 35 workers there have passed a federal background check and security clearance. “Nobody wanders around the terminal,” he said. Also, the 30 tanks are within a bermed area which is designed to handle 110 percent of the contents of the tanks. “There are very strict inspection regimens,” he said. Periodically, the tanks must be cleaned and X-rayed to determine that they meet a minimum thickness. If not, the tank bottom must be replaced, which isn’t cheap. That can run from $775,000 to $1.5 million, Therriault said. Steve Miller of the Islesboro Island Trust has spoken out about his concerns with the LPG terminal. He said that Sprague Energy is a responsible Searsport citizen and that his nonprofit group is not terribly worried about the fuels that are now brought in through the bay. But a large amount of propane is different, he said. According to pilot Gelinas, safety is something that is always on the minds of the people who help tankers and other heavily loaded ships navigate into port at Mack Point. The often-heated debate over the proposed liquid propane gas terminal sometimes seemed short-sighted, he said, with tank opponents stating safety concerns about having propane tankers moving through Penobscot Bay.